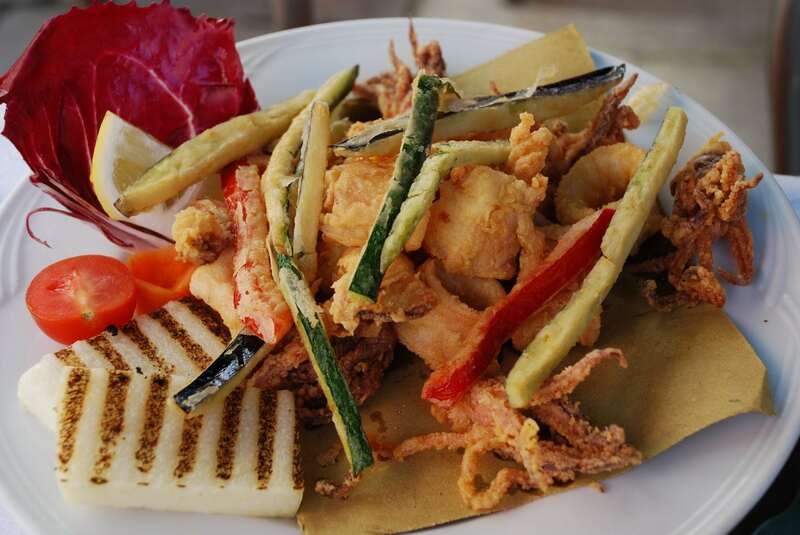 Nowhere else in Europe you will find the same variety of regional recipes you can find in Italy. With a bit of curiosity and, sometimes, courage, you’ll discover much more than just pasta! Italian incredibly high number of recipes derives from its being separated for centuries into many independent “states”, each one with its peculiar traditions, and from the variety of its territory (and what it could offer to be cooked). There’s also another aspect to consider: Italy was a rather poor country. The need to feed an increasing population with the available resources, united to the unbeatable Italian creativity, has given birth to some real weird, hence delicious, dishes. In this post I’m presenting a selection of my favorite “weird Italian dishes you are going to love”. Buon appetito! A complete food guide to the best Florence typical food you have to try when in Florence. 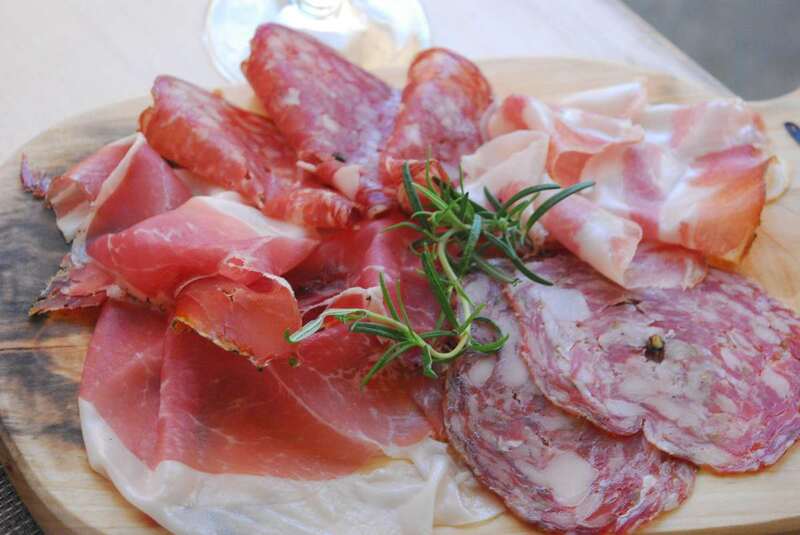 Eat like a local and enjoy these great typical Tuscan dishes. 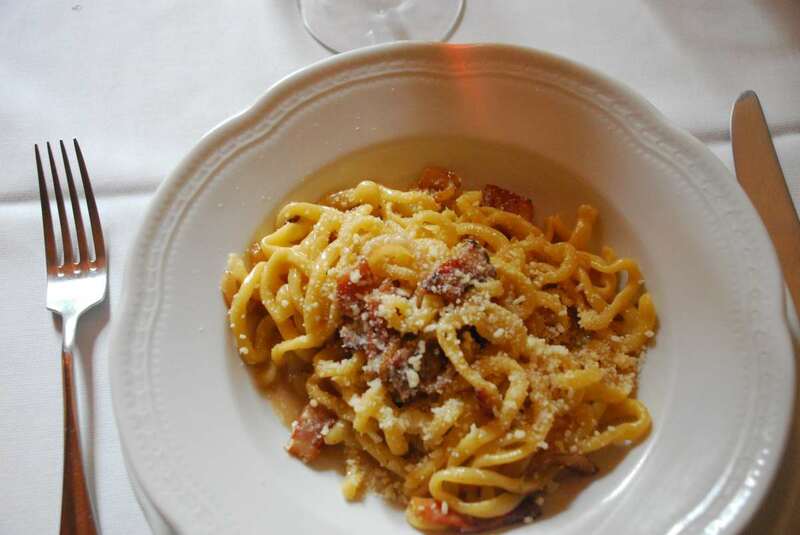 What should you eat when in Florence and in Tuscany? No, Pasta and Spaghetti is not the right answer! Of course you can find them in most touristic restaurant, nothing to worry about. However, Florence typical food is peculiar and so delicious that you absolutely need to try it. Actually, the best way to discover and taste local Florence food is to spend some time in the amazing food hall at Mercato Centrale, close to San Lorenzo. There you will find a huge amount of stalls displaying all the Tuscany local food you may dream of. Just choose what you want, point your finger, get your tray and enjoy! (read my post: Florence in a day for more directions) . Ready to start? So here is my Florence typical food guide! 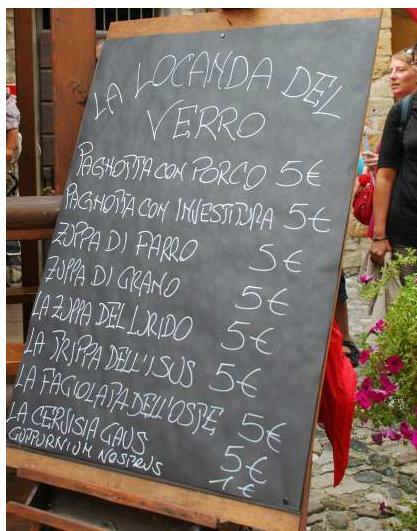 You will hardly find a Tuscan menu that doesn’t offer Crostinis with salumi and a flask of red wine! The word crostini literally refers to the bread, similar to a baguette where the patè is spread. 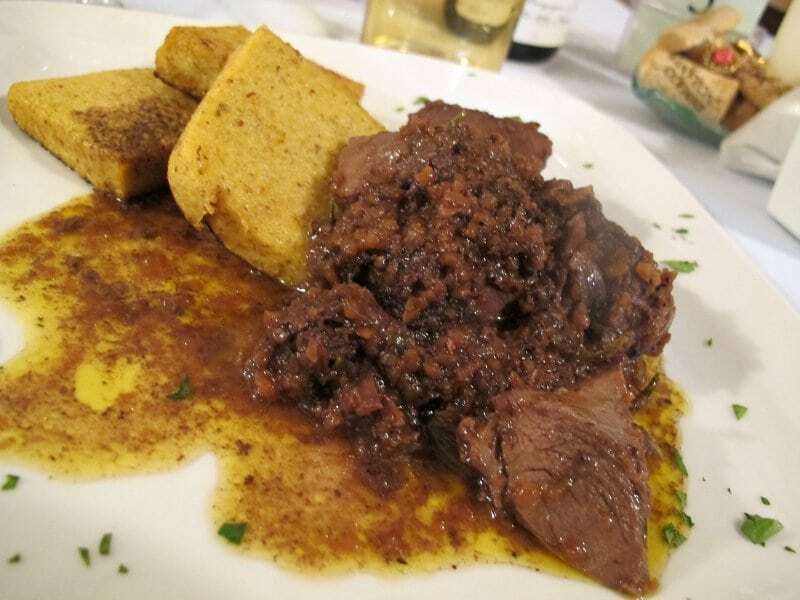 You will be offered many different type of crostini in Tuscany’s restaurants, but the real stuff is made of chicken livers. 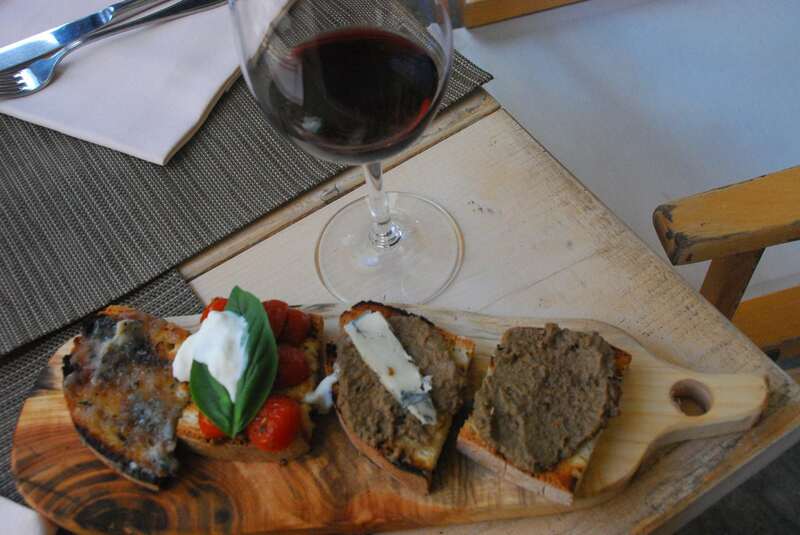 Other popular options are Bruschetta, crostini with minced tomatoes and olive oil and crostini with truffle oil. The “typical” antipasto generally includes all sorts of salami, ham and cheese. While this may not differ that much from the salami you normally find in other Tuscany areas, there’s one which is typicall of Tuscany and that you shouldn’t miss: the Finocchiona. Finocchiona is a variation on salami made of finely ground pork and fat, laced with fennel, and aged for a while. The unusual ingredient in finocchiona is fennel seeds, which give the salami an intriguing sweet, anise-like flavor. They are also behind the name, as finocchio means “fennel” in Italian. After the ground pork is stuffed into salami casings, the finocchiona is cured so that it becomes firm and dry. The Ribollita is the most famous Tuscan soup. It is a typical “poor” dish from the Florence and Arezzo cooking traditions, meant to reuse the left over bread and the most commonly available vegetables. The name, which means “reboiled”, derives from the former habit of preparing the soup in large quantities, usually on Friday. The soup was cooked a second time (and therefore “reboiled”) in the following days, before being served. Actually, the ribollita gets tastier each time it is reboiled. 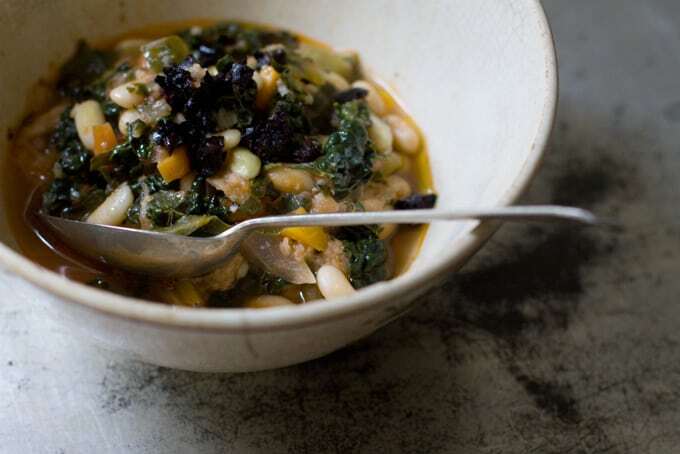 While many different vegetable can be used, a true ribollita always includes black cabbage (“cavolo nero”), Borlotti beans and dry bread. Once it is served, you should add one or two spoons of “exravergine” olive oil and freshly ground pepper. 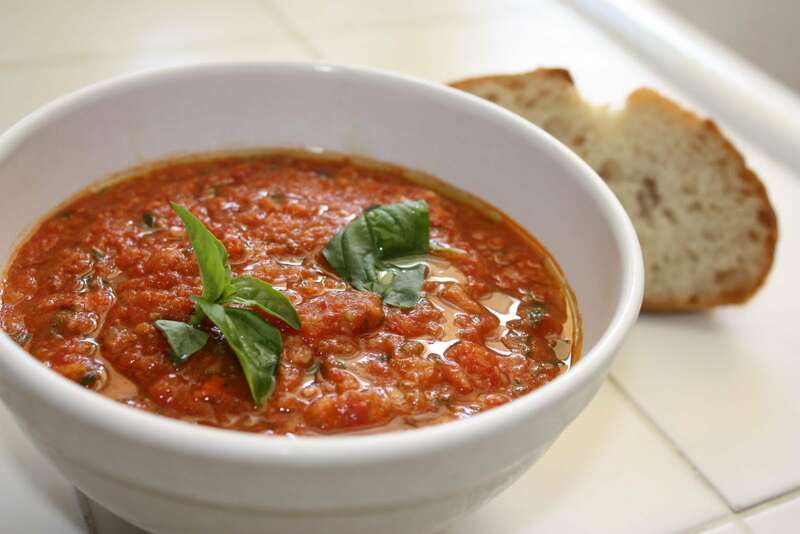 Half-soup and half-sauce, pappa al pomodoro is little more than ripe tomatoes, olive oil, and day-old bread. It’s a delicious summer dish, served in the majority of Tuscany restaurants. Pici is are thick, hand-rolled kind of pasta, like a fat spaghetti. The dough is typically made from flour and water only. It originates in the province of Siena in Tuscany; in the Montalcino area it is also referred to as pinci. Pici are served with a variety of toppings, such as ragù (often from game, such as duck, hare or wild boar – “pici al ragù di anatra-lepre-cinghiale”), spicy garlic tomato sauce (“Pici all’aglione”) or porcini mushrooms (“Pici alla boscaiola”). Pappardelle are large, very broad flat pasta, similar to wide fettuccine. The name derives from the verb “pappare”, to gobble up. The fresh types are two to three centimetres (1 inch) wide. 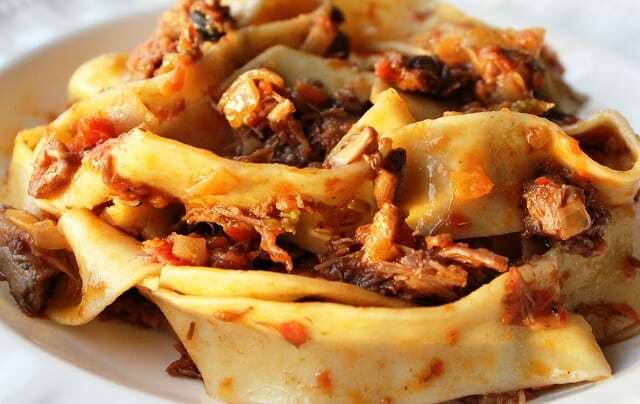 Like Pici they can be served with a variety of toppings, even though most popular Pappardelle dishes are “Pappardelle alla lepre” (hare minced meat sauce) or “Pappardelle al cinghiale” (Pappardelle with wild boar topping). 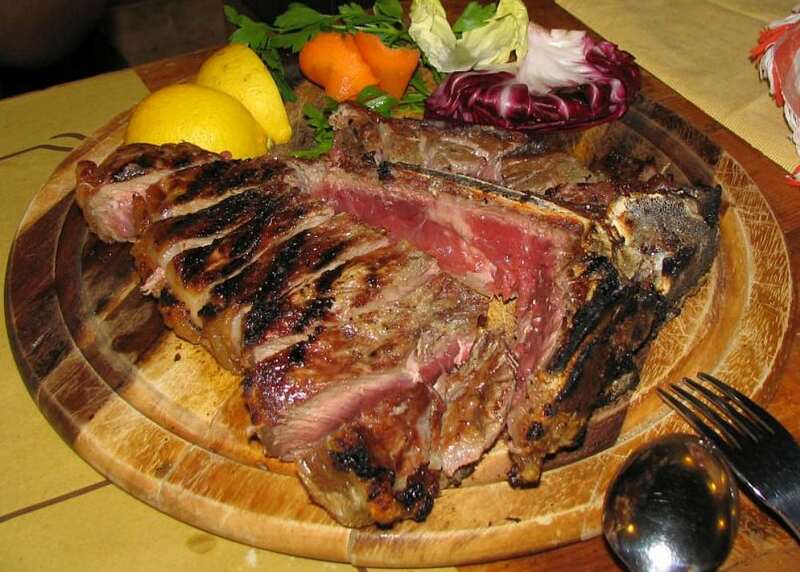 The most famous tuscan meat dish is actually… a T-Bone steak! 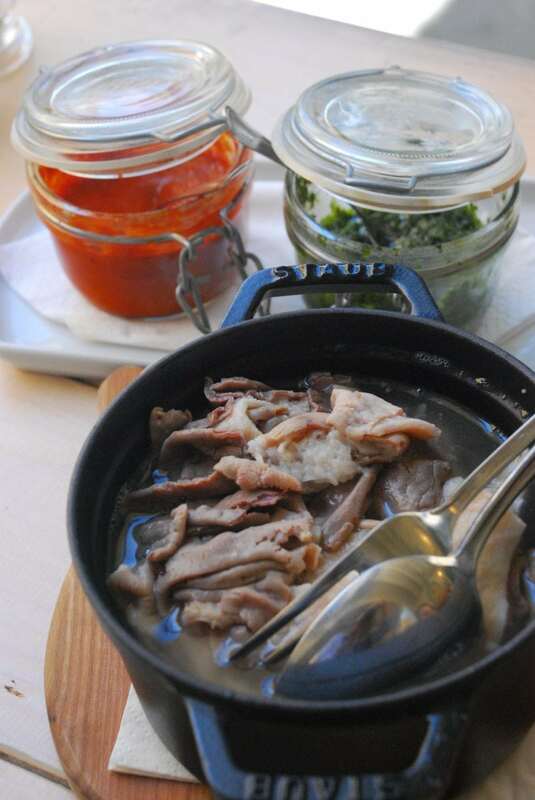 Lampredotto is a very famous dish from Florence, that you may find in restaurants or as street food (“panino col lampredotto”). Lampredotto is the fourth stomach of a cow, boiled in water with tomatoes, onion, celery and parsley. A typical Florentine peasant dish, the most popular way to serve it is in a bread roll, with parsley sauce and optional chili oil. ‘Snap up’ a hot cow stomach sandwich at one of the many street and market stalls in Florence that serve it. The most famous one is just in front of the famous “porcellino” statue. This is not a typical Florence food, but it’s worth mentioning because you may find it in your menu, and it’s delicious! Cacciucco (also called Caciucco alla Livornese – Livorno-style cacciuco) is a popular traditional Livorno seafood dish, fairly common also in Pisa, Lucca and in all the Tuscan coast. It’s a delicious soup of assorted sea fish, shellfish and molluscs, poured over the toasted bread, which history stretches back at least five hundred years. 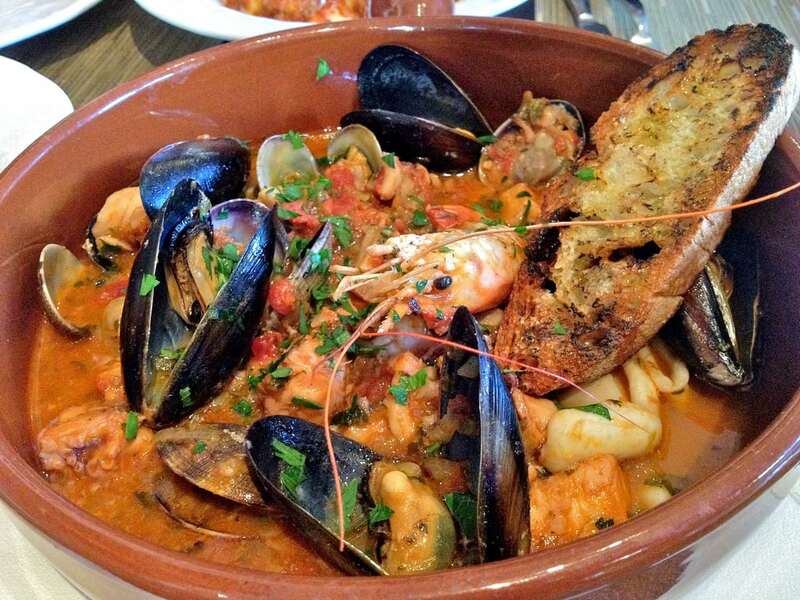 The origin of dish name also proclaims the fact that cacciucco is rooted in a mixture of culinary cultures of many nations. It bears resemblance to the Turkish word ‘küçük’, which means ‘tiny pieces’ – small fish and molluscs were used to prepare the dish. Originating in the city of Prato (close to Florence), Cantucci are presently the most famous cookies in Tuscany. You will probably be offered Cantucci col vin santo after all your meals! Cantucci are oblong-shaped almond biscuits, made dry and crunchy through cutting the loaf of dough while still hot and fresh from baking in the oven. 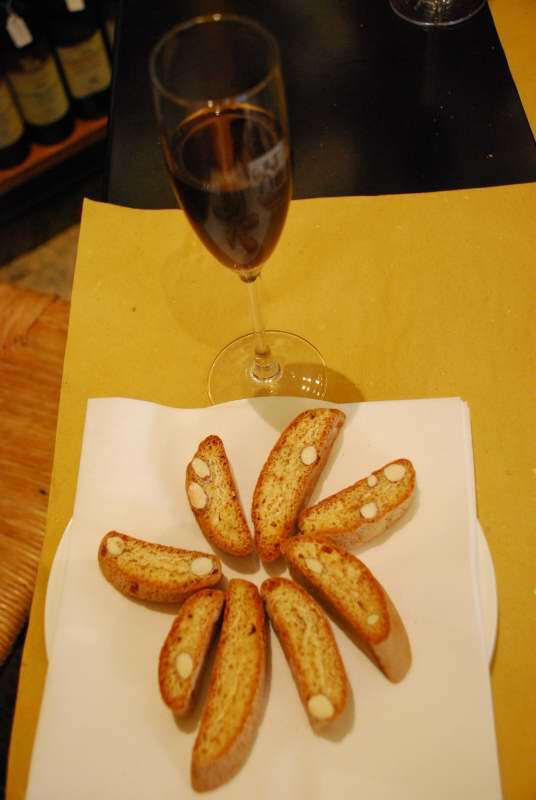 Traditionally, you are supposed to dip them into a glass of vin santo (Tuscany sweet dessert wine) before savor them. Panforte means “strong bread” which refers to the spicy flavor. It’s the traditional Siena cakes, and its origins may date back to 13th century. The process of making panforte is fairly simple. Sugar is dissolved in honey and various nuts, fruits and spices are mixed together with flour. The entire mixture is baked in a shallow pan. The finished cake is dusted with icing sugar. The result is heavenly delicious! 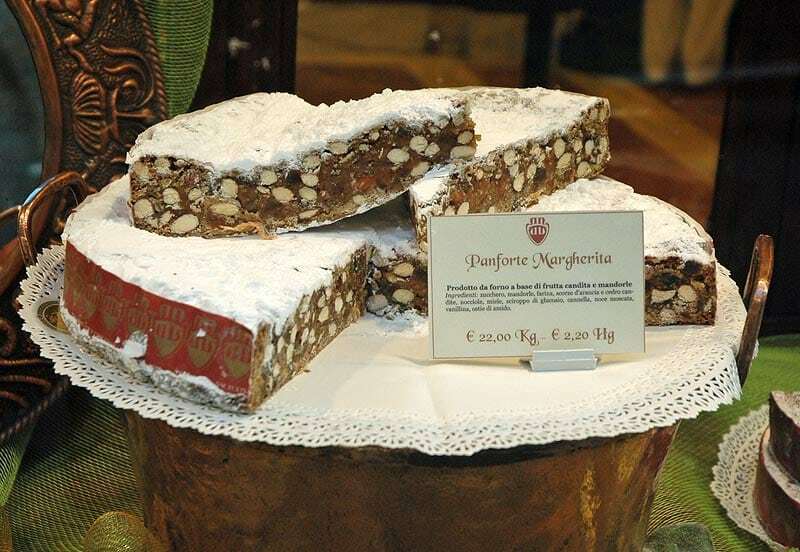 You may taste Panforte as a dessert in restaurants or purchase a slice in a “pasticcieria”. A tasty and spicy variety of Panforte is “Panpepato”. 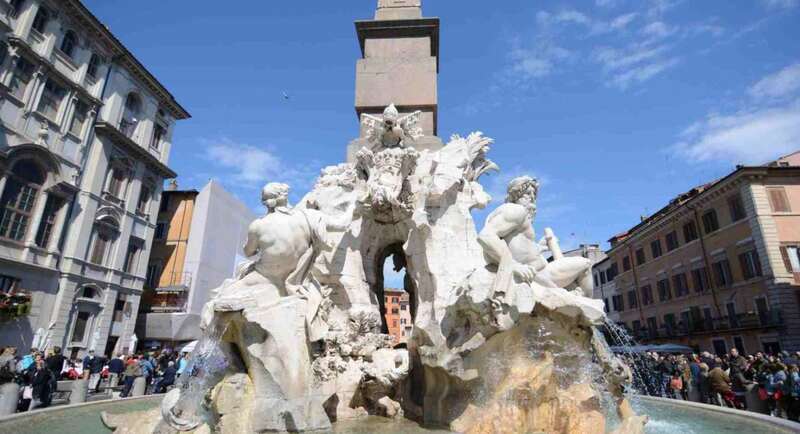 Florence can provide you with all kind of great experiences! Click here to check your many options, from guided tours to shopping, food experiences and more!